The MX800s are designed to drive rigs based around EAW speakers, and came in a number of configurations depending on what particular EAW speakers you were using. This particular crossover is designed to drive SB850 subbass speakers with KF850EF mid-tops. The latter are enormous tri-amplified brutes that can handle a total of about 1600 watts. The crossover had blown rather spectacularly during a performance, apparently emitting 50hz at full volume on all 4 channels. As this was during a drum and bass night the crowd reportedly went wild (in a good way) until they figured out that it was unintentional! 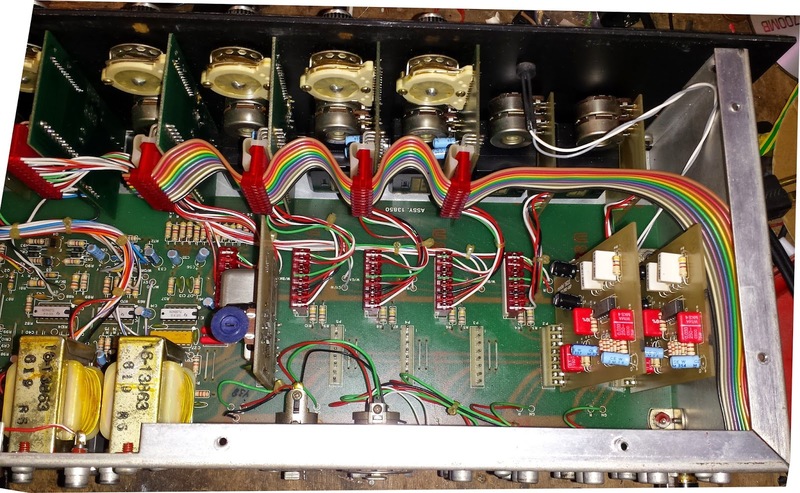 Dismantling the unit revealed that the unit had blown its main +15v input regulators (7815 and 7915 respectively) and filter capacitors. 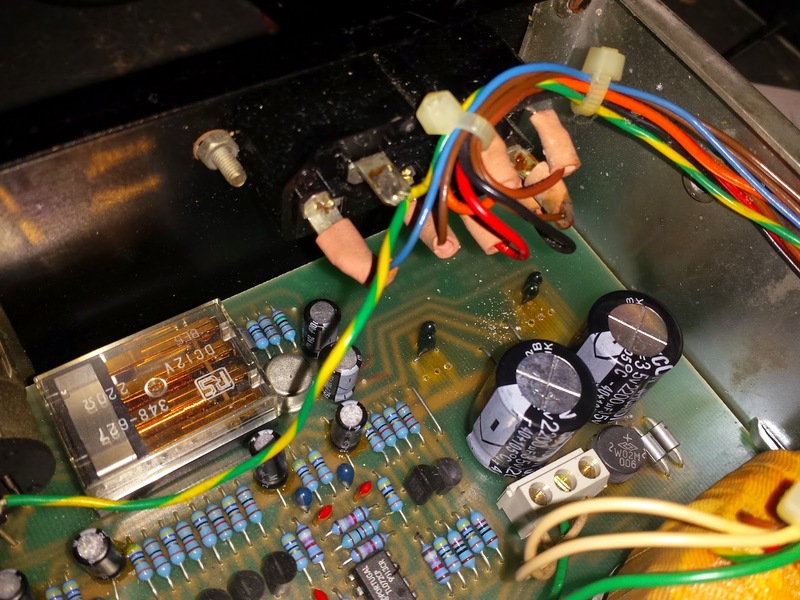 Interestingly the filter capacitors seemed to be rated rather low (+-16v for a ~21v transformer output), perhaps as a result of an earlier repair. 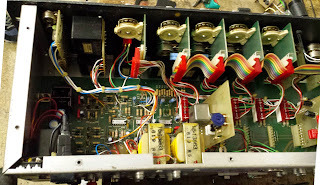 The PCB tracks under the power section had also burnt slightly so required replacement. I used SIL-Pads and nylon screws to avoid ground loops, and epoxied them into place to stop them moving around. The unit powered up perfectly on the first try. A quick sound check with the workshop speakers proved all channels still worked. I have yet to do a burn-in test with the new heatsink configuration, but after 20 minutes of running all 8 outputs the regulators didn't get more than slightly warm. We will be testing the crossover with the full setup on thursday night. 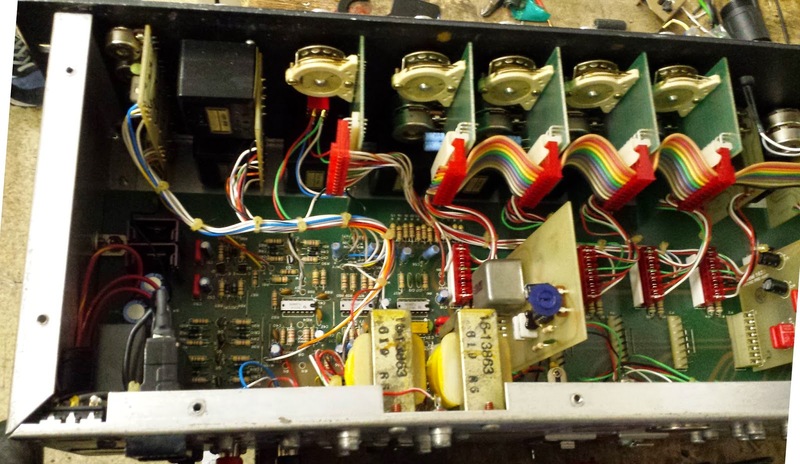 My mate Giles bought a Urei 1620 which is a fascinating 1980s-era mixer. 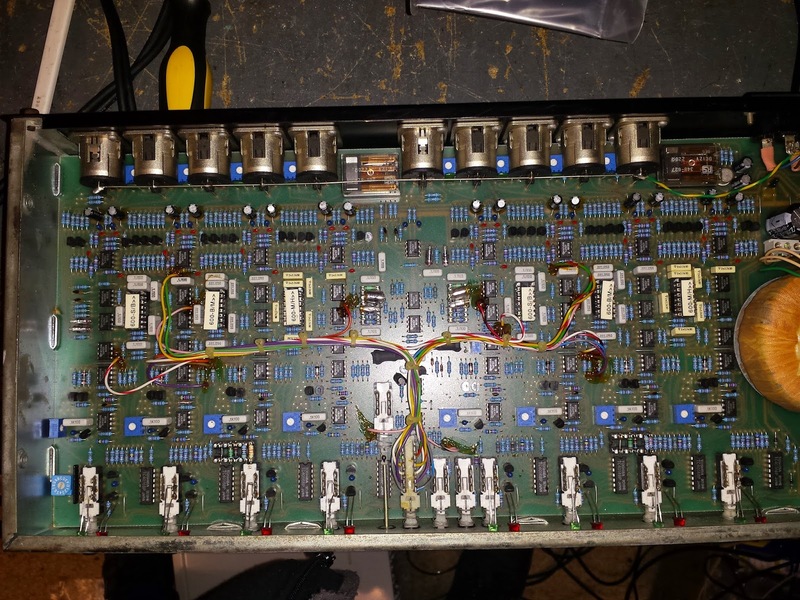 It's in fairly good cosmetic condition (in fact it looks very pretty) but there's something up with the output circuitry, it sounds really shrill and nasty. Since the effects loop gives out a perfect sound it must be the master output. I'll have to go over the circuit with an oscilloscope. 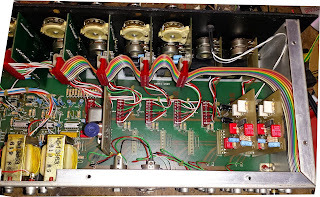 The phono/RCA connectors on the back are slightly corroded, and generally feel incredibly loose since they're mounted to a PCB rather than being chassis-mount. 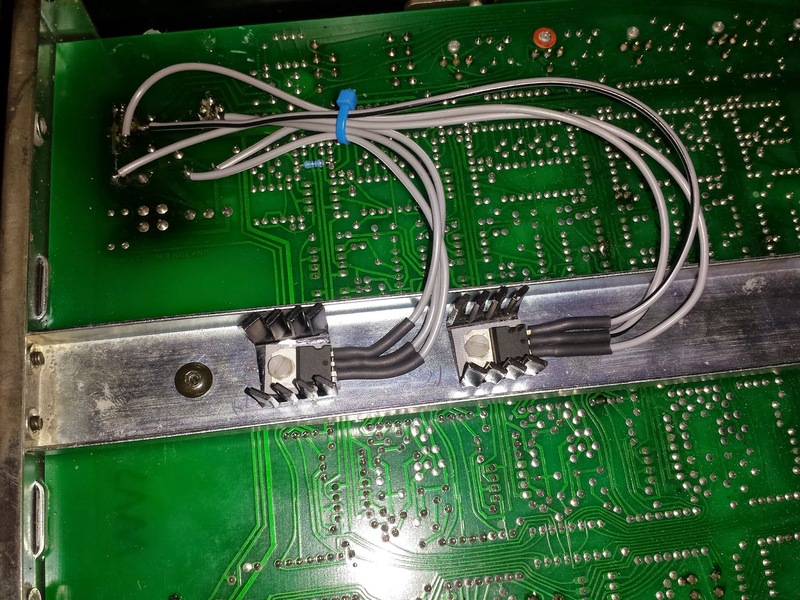 I'll likely replace them with high-quality gold plated connectors, possibly by making another PCB. The XLR connectors are similarly corroded but they can be replaced easier as they are chassis mount. Apart from that, per-channel effects loops would also be great as the UREI does not have per-channel EQs. Giles also wants the master EQ and per-channel balance controls bypassed, and also is asking if we can have per-channel cue buttons like on the Pioneer DJM series. I'm sure all this will be possible.